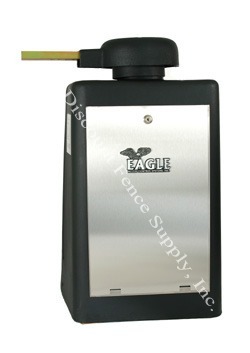 The Eagle-100 is our specially designed 1/2 horsepower swing gate opener for residential applications. This Gate openers will handle gate up to 16' and 400 lbs at an opening speed of approximately 15 seconds. The "no-pinch" arm is an added safety feature. It prohibits the arm from extending past the gate openers body when the arm is in it's fully extended position. The dimensions for the Eagle-100 are 17" (W) x 17" (D) x 28" (H). Diamond Control Board - The unique Diamond board uses state of the art technology combined with easy of use to provide many exceptional new features that cannot be found on any other board. 2 Wire Maser/Slave - The Diamond board uses a unique Master/Slave system that requires only two wires. Motor Brake - If the on position is selected, the gate will stop instantly when it reaches the limit switches. This is essential on uphill/downhill applications and on all Fail Safe operations. One Pass - This tailgating feature works with the reverse loop to allow only one car to pass. After the car passes the gate closes instantly, if a second car approaches the gate stops, and resumes closing once the car has left. Stop-Reverse - This radio feature allows the transmitter to work as a three-button station and is useful for partial opening. The first command opens the gate, the second stops the gate, and the third command will close the gate. Timer - The adjustable timer can be set from 1 to 60 seconds, with a maximum run time of 60 seconds. Overload - If the motor reaches the stall amp for 3 seconds, it will automatically shut down. Receiver - The receiver terminal is mounted on the control box for easy installation and is pre-wired for a 3-wire or 4-wire receiver. Stainless Steel Access Door - Offers full access to the control board through the locking stainless steel door. Gate Opening - Can operate to either the left or right side. ERD - If the gate hits an obstruction while closing, it will reopen. If it hits an obstruction while opening, it will stop, reverse 6 inches and stop again. The sensitivity is adjustable separately for the open and close cycles. Global Inputs - The Diamond board's Global Inputs include key switch, keypad, exit loop, phantom loop, reverse loop, edge sensor, open, stop, and close. Outputs - Outputs include on board 24 VDC for MAG Lock, alarm, and 24 VAC auxiliary power. Safety Alarm - If the gate hits an object twice while closing or opening, the system will shut down for 5 minutes. On the Diamond board you have two options for reset mode. Selecting the off position will require a manual reset of the board if the previous happens. However, by selecting the on position, the system will automatically reset itself. 120 VAC Power Outlets - The operator contains two 120 VAC Power Outlets for the users convenience. Power on/off Switch - The operator has an easily accessible power disconnect switch that allows for easy installation and service. No Pinch Arm - This safety features prohibits the arm from extending past the operator's body when the arm is in the fully extended position. Warranty - Five Year residential use.